You Can Heal Your Life is a practical and insightful book that can show you just what role your mind plays in the overall well-being of your body. This bestselling book has been of great help to millions of people all over the world, who have needed healing in some area of their lives or the other. No matter what kind of healing you're looking for, this book offers you advice that can guide you in the right direction, thus helping you heal your life. The author has been able to explain just how our negative thoughts and beliefs about ourselves are able to lead to various health conditions and emotional issues, that can ruin our lives. She also shows her readers just how they can make use of certain tools to change the way they think, which in turn, can change their lives for the better. The author believes that just about anything can be healed with the right thought-patterns. This book provides you with in-depth insight into the relationship between the mind and the body. It also gives you much-needed insight into the root cause of several ailments in modern times. This practical guide is bound to help you reshape your thought-patterns for the better. 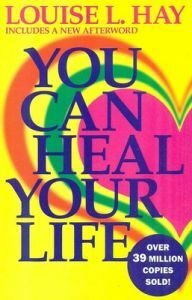 You Can Heal Your Life has been published by Faber, in the year 2008 and is available in paperback. Key Features: The book has been a New York Times bestseller and has sold more than 39 million copies all over the world. The methods and guidance offered by the author have been able to bring relief to millions of people everywhere.